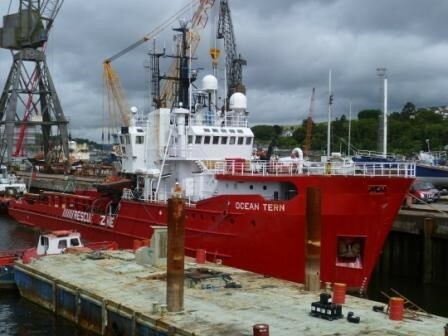 The latest vessel to join the fleet is the ERRV/MRV/Supply Vessel Ocean Tern which has recently departed Cork in Ireland and it is currently transiting towards the Black Sea where it will proceed to Kazakhstan to join the CM Italia on Charter to KMTF/N-Operating Co supporting the Maersk Explorer Rig. This vessel will be providing a full ERRV provision to the drilling programme as well as providing supply capability as it can carry liquid Mud and Dry Bulk as well as Fuel for the drilling campaign. Whilst the vessel was being prepared for transit the crew took the opportunity to carry out Fast Rescue Craft training.